David Bennigan writes - "I recently got Director Status from YouTube and I have some long movies in AVI or MPG format that I want to split or cut into smaller pieces, but I don't know how to. Any ideas?" There are two simple methods for cutting a large video into smaller chunks. Open the video file in Windows Movie Maker and drag the clip in the movie timeline. Play the clip until you reach the point from where you want to trim it. 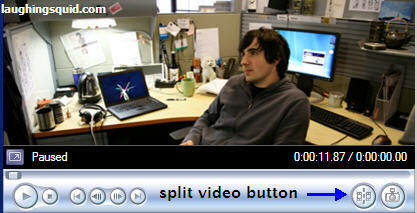 Now click the Split Clip button on the Preview Monitor or press Ctrl+L. This splits the video into two parts. Repeat the process with the second portion and finally export the trimmed video in the desired format. If you have a large video file, Windows Movie Make may not be the best option and we prefer using Virtual Dub, which is open source and available on all platforms. Virtual Dub supports practically all video formats include DivX, MPEG, AVI, etc. Once you have made the selection, goto File->Save As AVI to save only that portion of the video on your hard disk. The VirtualDub method is highly recommended for chopping big videos. You can even capture live streams of video and save them to multiple files.